My Chicopee quilt is finished and already off to a new home as a little housewarming present for my cousin and family. I love this new line by Denyse Schmidt, and as I mentioned before, I really love how the entire line looks together. And I think the color palette lends itself well for the fall season. I can totally picture myself relaxing on this quilt among newly fallen colorful leaves. I’d probably be sitting next to a pumpkin and munching on an apple. Definitely… But anyway, you know what I’m saying, right? Great bold colors, and a fun change from all the softly colored Liberty florals I’ve been working with lately. I decided to do a type of string quilt, using wider strips and positioning them any which way, along the lines of Denyse’s Any Way You Slice It quilt pattern. Some of my strips ended up short, so I started piecing them, and I really like that extra little addition. The backing is made up with some extra Michael Miller Cotton Couture solids, and a few of the leftover Chiccopee prints, along with a fun diagonally pieced strip of leftover scraps. I attempted Denyse’s signature loopy quilting, which was a fun change. I need some more practice, but I do love the way it looks on this quilt! I worried about giving this one as a gift, since those bold colors may not appeal to everyone, but in the end I decided it might provide a nice pop of color. And I must say, it really looked right at home in their new place! Previous post about this quilt here. This entry was posted in [search] String Quilts, Fabric, Posts about Quilts, Quilts. Bookmark the permalink. Great composition for these gorgeous colors. 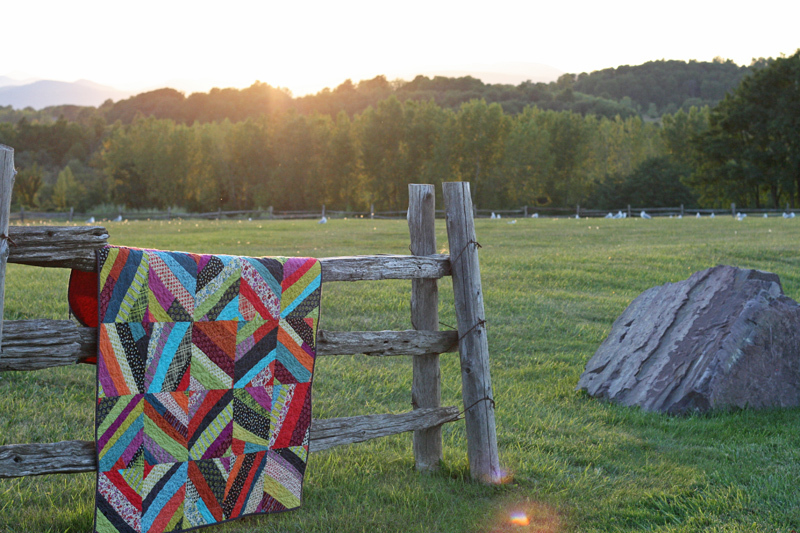 Wonderful quilt for the fall that really looks good for all seasons! What a nice gift! I love this quilt. And I love the photo location, too. Those colors look so good! The bold colors are perfect! Piecing together the too-short strips is a great idea. I think the recipients will love this. I know I would…now I have to make it! Ha. This is wonderfully beautiful!!! 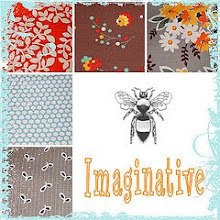 Gotta go get some of this fabric!!! Love it Ashley!!! Oh, so so beautiful. I am in love with Chicopee, and you really made it shine. Stunning colours. I’ve decided that you must suffer from hyperthroidism and obviously have too much energy. You seem to complete quilts at such and amazing speed. Do you work also or is this your lifes blood passion and wage? I really am being nosey but you do produce a lot of wonderfu work at such a rapid pace. Well done! This is So Fabulous..I love it, I have to order me some now, the hard part will be making slashes through the fabric, usually my scraps are for the strings we make on flicker but this is just great. Please check out my Blog today too. The quilt is just lovely. I think I would always choose “color” over a neutral when giving a gift. I’m not sure why. You’ve given me something to think about today! Beautiful finish and a thoughtful gift for your cousin. I bet they are thrilled with it, it is just stunning! Give it as a gift to meeeeee! I like bold! Just kidding… it probably better go to someone you actually know. It is fab tho. wow, totally magazine worthy, both the quilt and the pictures. beautiful job ashley! 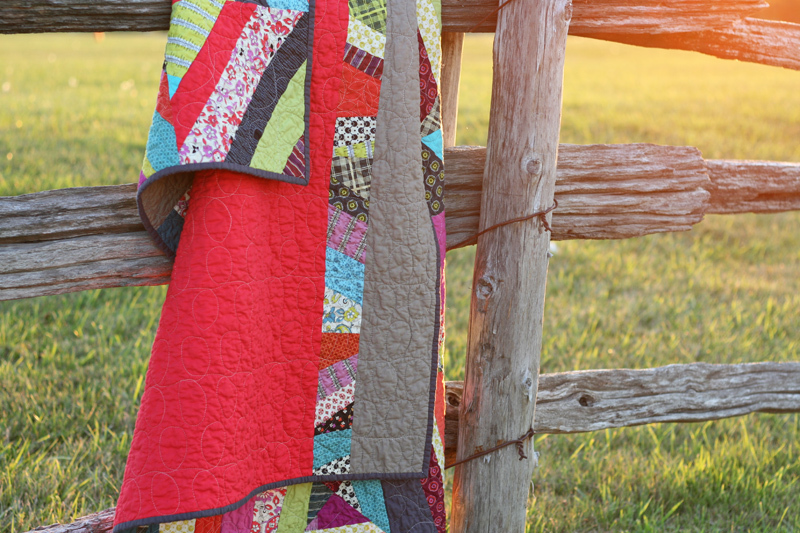 I love the bold fresh colors and the loopy quilting. Great job. You inspire me many days when I see your beautiful quilts posted or one you are working on. Love the quilt! It is about time I did another one. May need to do something similar with my scraps. 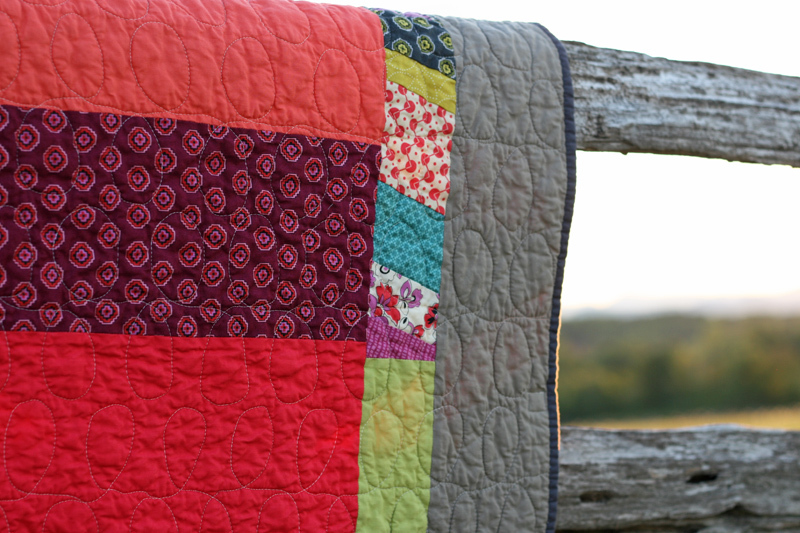 Your quilt is one of my top 3 favorite quilts ever! I just love it – and the photos are great too. I bought the fabric line after seeing and still working on a modified log cabin. Thank you for sharing your photos – inspirational! I’ve been lurking for a long time, admiring your beautiful quilts (and also your lovely children, Max is so big now and Hazel is so so precious!). 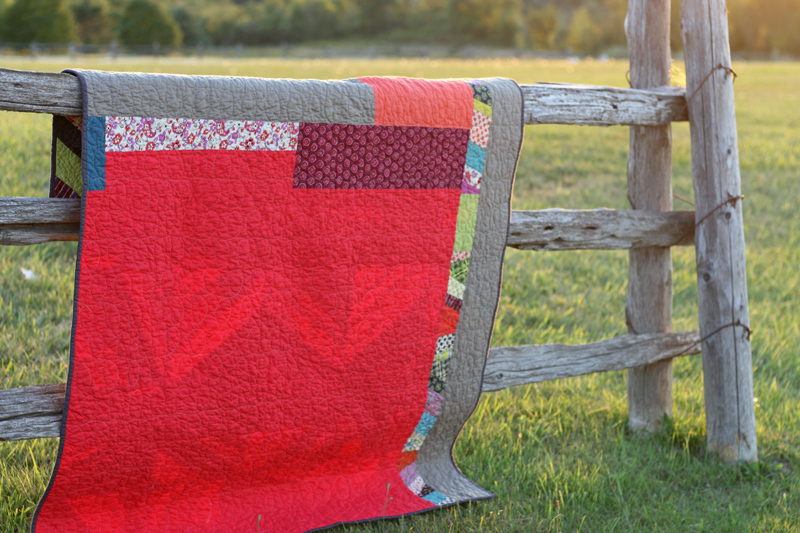 I especially love this Chicopee quilt – I bought a couple of fat quarter sets because I love the mix of color and patterns together and thought it would be a good choice to make a quilt for one of my sons – masculine enough to suit him and still satisfy my need for color. I have the book with the Any Way You Slice It quilt, but I’m not going to use templates, ack. 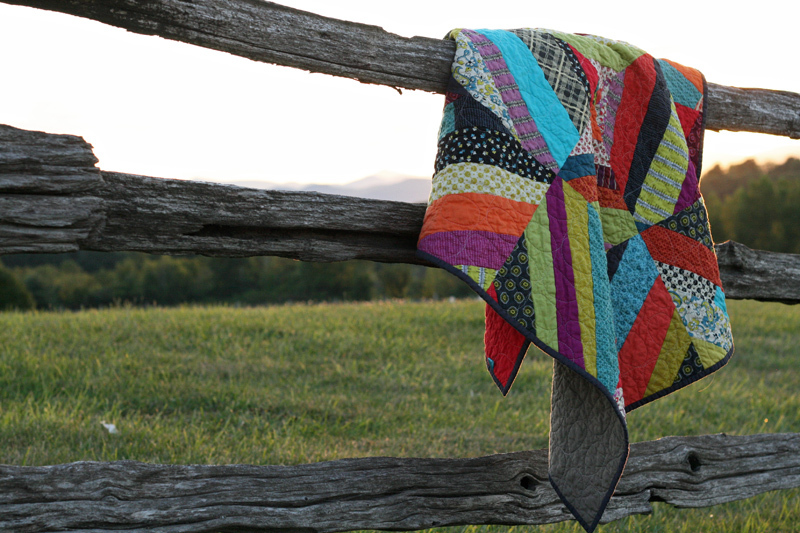 I’m curious about how you constructed your blocks for this quilt. 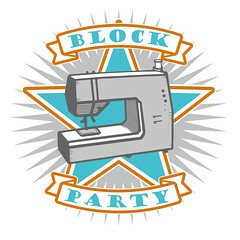 Cut straight strips and sewed wonky? Foundation pieced on paper like a string quilt? Strips sewn together and then cut on the diagonal? I’ve made several quilts using squares, 9-patch, simple rail fence, but I wanted to make him something with a little zing (this is an adult son). I know I’m a bit late to be asking questions about this quilt since your post is from 2012, but I just recently found it when I did a search for quilts made of this fabric. I don’t know how I missed it before. Any info will be much appreciated. 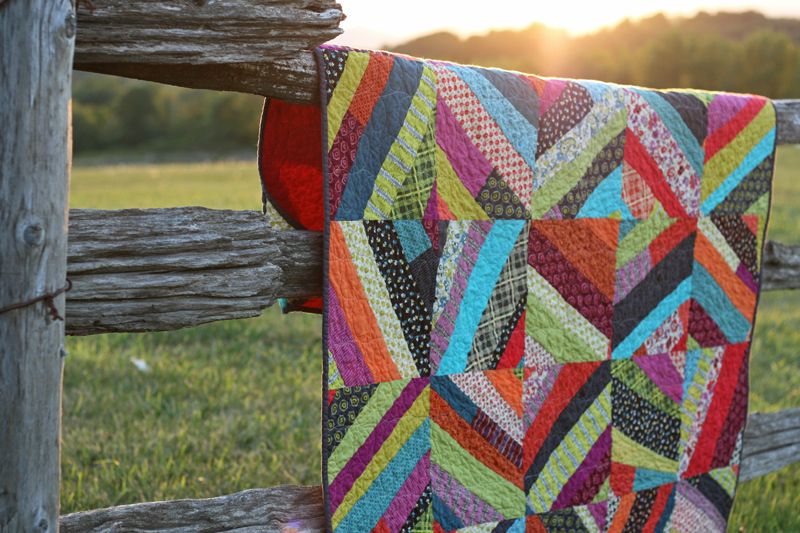 I love how you share your work, and your tutorial for string piecing is so helpful. I use freezer paper, which zips off like a dream and comes 18″ wide so I can make large blocks. Take care. I’m in love with tissues as well, are beautiful too. Beautiful! I loved this website. Que lindo achei gostaria de ter uma assim. Parabéns pelo blog é muito bom.